The Senior Associate of Supreme Court team, is senior member who is not only enrolled as Advocate of High Court also has significant experience of pleading before different Hon’ble Benches of High Court Division. The person on full time basis remain available in the High Court and Supreme Court premises to analyses daily cause list, as published by Hon’ble Supreme Court of Bangladesh on daily basis. As a member of the Team he maintains liaison with Head of Chambers, High Court & other member of our Supreme Court team as well, so that each item listed is taken care of & fully represented by Head of the Chambers or by other eligible & qualified lawyer depending on their importance & complexity of the matter. Besides he/she also oversees the clerical work in parallel with the above work with help of our registered Clark & management staffs. Mr. Sheikh Abdullah successfully completed LLB and LLM under the University of Southeast. He has a right of audience before High court, judge’s court and most tribunals. He is register member of the Supreme Court and Dhaka Bar Association. He joined in the year of 2012 and has been working for the firm as a senior member for nearly 5 years in the Supreme Court Team. Mr. Abdullah has appeared in a number of cases before Hon’ble High Court on banking matters and successfully conducted a number of banking litigation notable for First Security Islami Bank Ltd. and Dutch Bangla Bank Limited for the firm. Besides, Mr. Abdullah has gained significant expertise for corporate crime matters. He was involved in few cases in High Court as lead counsel in particular crimes involving banking transactions and related bail matters. Successfully pleaded before Hon’ble High court over a disputes involving electricity connection. Successfully pleaded before Honorable High Court over a disputes involving dishour of Cheque. successfully pleased before Hon’ble High Court over a banking loan recover matter. His involvement was crucial in a quashment proceeding brought against fraud case out of international payment lodged against one of our Taiwanese client in Magistrate Court. He has developed notable expertise for trade related fraud and misappropriation. He is disciplined, punctual person. 2008– LL.M from University of Southeast. 2007– LL.B (Hon’s) from University of Southeast. 2012– Enrolled in the High Court Division of the Supreme Court of Bangladesh. 2009– Enrolled in the District Court & Tribunals. 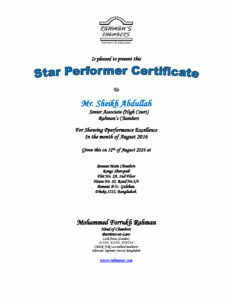 Awarded with Best Individual Performer Certificate – July 2016.